Black Hero- Batwing’s suite is the undoubted star of this book. Hands down it’s a piece of tech that works well in pretty much every single issue. Blend- Batwing has a nice blend of the realism in it’s characters motivations and emotions while mixing in the surreal element of super heroics and fantasy.Gruesome George is beautifully characterized then at the end these demonic creatures show up which pulls you out of things but it’s par for the course here month in and out with Batwing. Art- Eduardo Pancisca’s art as always is a highlight of this title and they continue be. Villain– I found Gruesome George’s back story quite engaging and touching. It was well thought out, well executed. It’s been a strength of the new Batwing series how it handles introducing its villains. Gruesome George is a worthwhile addition to the Batwing rogues gallery. 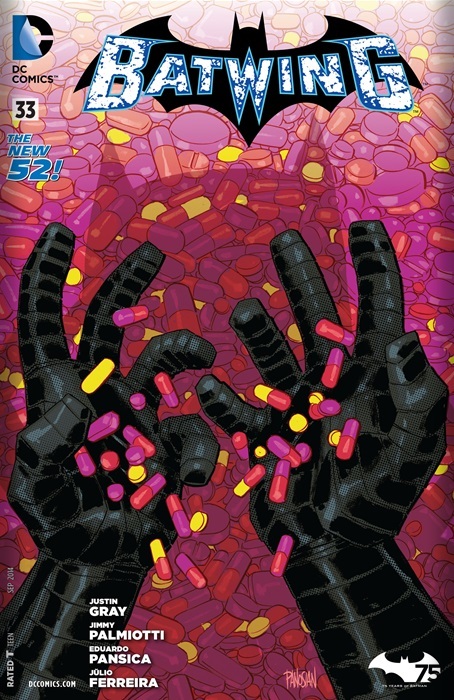 Cover– I’m not feeling Batwing’s hands and ocean of pills on this month’s cover. The End– I’m getting all misty eyed, next month marks the end of my New 52 fixation. It’s a pity sales for this book could not pick up or stabilize at a reasonable number so this title could continue. Alas it’s the end of the line boys and girls. Batwing beat Voodoo, Static Shock, Mister Terrific and Firestorm. That is no small feat and everyone who’s been involved should be very proud that they were involved in the new 52’s longest running solo black book. Cheers! Tale– While I enjoyed the issue, the notion that Batwing #34 is the last of this book made the use of more than half of this book dedicated to a villain’s introduction who will never be used by another writer is kind of sad. It was a great intro but took away from the star of the book, the titular Batwing. ← It's Official- The Falcon is the New Captain America! I feel as if DC does not want to have Black Comics as much as Marvel. It’s sad cause there is so much potential there with their Black Characters. It’s astounding how much the idea of having a Black hero gets so over complicated and the fans have to pay for it. It makes me not want to with the comic industry or any predominantly white industry because of lack of steady and worth wild representation.